About the same time I said good-bye to commercial face wash, moisturizer, and body lotion, I also said see you later to my trusty tube of ChapStick. Check out the list of ingredients that I had a hard time finding since ChapStick doesn't list them on their website. No wonder, take a look. Um, no thank you. The main ingredient is petrolatum, a by-product of crude oil. And don't get me started on the generic term "fragrance." Companies aren't required to release what chemicals make up their "fragrance," which I think is pretty scary. There are no nutrients in ChapStick, just a bunch of chemicals I can't pronounce. I switched to all-natural oil and shea butter instead. 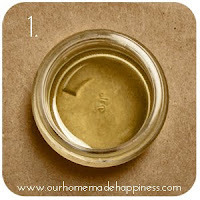 I could create a fancy homemade lip balm, but I prefer the simplicity of pure oils. The best part, they are packed with naturally occurring vitamins and nutrients that any lips would love! 1. Apply a touch of oil. 2. Finish with a dab of shea butter. Coconut oil, sweet almond oil, avocado oil, and apricot kernal oil are my top choices for lips. I'm already using oils to moisturize my face and body, so I rub a little on my lips at the same time and then I apply some shea butter to seal in the moisture. You can use oil by itself or shea butter by itself, but the combination of oil and shea butter together is ultra-moisturizing. I love the combination so much that I use it on my hands when they are really dry (right before I get in bed). If my hands are just a little dry, I use shea butter by itself. Known for its anti-aging properties, unrefined shea butter is rich in vitamins A, E, and F. Shea butter loses nutrients as it's refined. Same goes with oils. Try to get cold-pressed, unrefined oils when you can. You can find oils and shea butter at your local health food store, Amazon, or Mountain Rose Herbs. If unrefined oils are too pricey, less expensive refined oils are still way better than the junk in commercial beauty products. My container of shea butter is a bit large to slip into my pocket like a tube of chapstick, but I find if I use it before bed and after I wake up I don't need to keep reapplying it throughout the day. 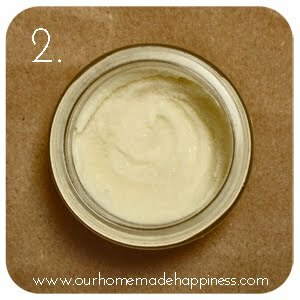 Just in case, I scooped some shea butter into an old clean lip balm container that I keep in my purse. Not only do oil and shea butter keep my lips super soft and kissable, they also save me money. How do you keep your lips moisturized? Do you know of any other uses for shea butter? hey kendra, so nice to see you out in blogland:) sorry to take so long in answering that question about laundry soap and you probably already made yours, but for what it's worth, i LOVE the Zote kind i made. is still pretreat with oxiclean if needed, but i have felt really good about the laundry soap's ability to get out stains and get things clean. hope you are well. way to go Kendra look at you doing so many awesome things!! This is great! I hadn't thought about doing lip balm yet, as I'm still using my Burt's Bees chapstick. I already have both of these ingredients after making my own lotion, so I will try this! I recently discovered your site and find it really neat! Thanks for sharing your ideas. I am wondering with this lip balm if you can combine the oil (I'm thinking coconut oil) with the shea butter in the same container or if that affects it in some way. Thanks for your reply. ....or maybe just the coconut oil with an essential oil? Hi Angela, you should be able to combine coconut oil, shea butter, and essential oil without any problems. Those ingredients are combined all the time to make lotion, lip balm, etc. You might need to melt them so it's easier to mix together. If you try it, let me know how it goes!